Or view larger version. Jack Weinberg being interviewed from inside the police car that was taking him away after his arrest for violating U.C. Berkeley's rules against political activity on campus. Oct. 2, 1964. Bill Crouch, photographer. Gelatin silver print. Collection of Oakland Museum of California. The Oakland Tribune Collection. Gift of ANG Newspapers. On Oct. 1, 1964, U.C. Berkeley student Jack Weinberg was manning a table for the Civil Rights organization CORE (Congress On Racial Equality) on the Berkeley campus. The school administration had banned all political activity on school grounds and Weinberg was arrested. When a police car drove up to take Weinberg to jail, students spontaneously surrounded it and refused to move. 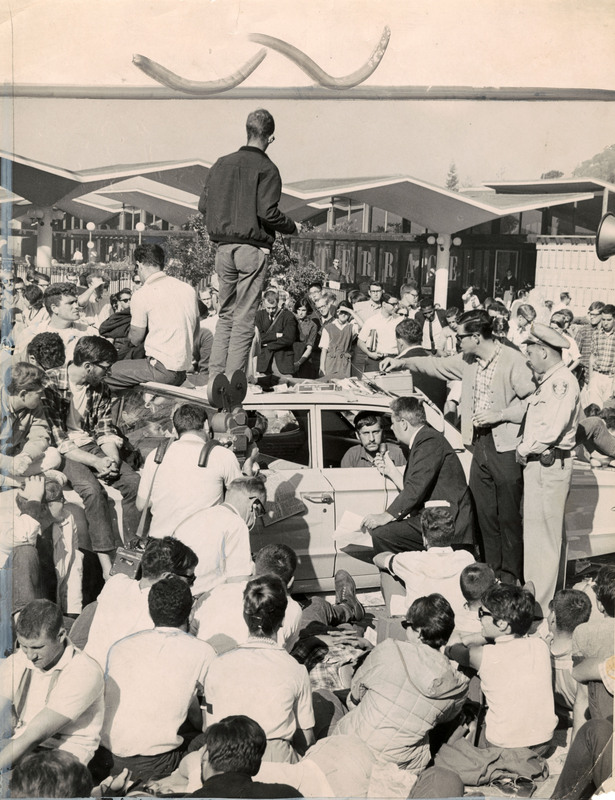 That would begin a 32-hour ordeal as Weinberg would remain in the car as students one by one would mount the roof of the vehicle to express their ideas about the arrest and free speech. Such a speech is shown in the picture. Weinberg is being interviewed by the man in the suit. Eventually Weinberg would be released after a deal was brokered between student protestors and the school administration. The arrest however would give birth to the Free Speech Movement that championed free speech on campus for student activities like CORE member Weinberg.